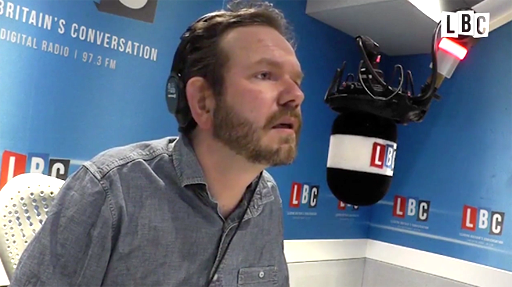 Discussing homosexuality and religion on his LBC radio show in the UK, host James O'Brien shut down a "Christian" caller named Daniel with just one question. "What did Jesus say in the Bible about homosexuality?" But O'Brien cuts in to point out that the First Corinthians is "a letter written by someone who never met Jesus." He adds: "1 Corinthians is a letter that St Paul wrote. What did Jesus say, on the record, in the Bible about homosexuality?" As Daniel struggles to answer, O'Brien keeps on coming. "It’s a simple question. What did he say? You can say nothing, because that’s the true answer, or you can carry on blustering," he says. In all, O'Brien asks Daniel what Jesus said about homosexuality an incredible 27 times. He tells the befuddled caller: "Listen, you have a great day. May God go with you. You can't answer the question about Jesus... which is kind of the point. Which leads me to conclude what you're really terrified of Daniel is something that's going on inside of you."